How do I manage additional instructor accounts? Step 1: Navigate to "Instructors." Step 2: Click "Add Instructor" to register new instructors. You can add a new instructor, or you can make an existing ProProfs user an instructor. Select a method and fill out the required details. When adding an existing user as an instructor, the user's private code would be required. The users can retrieve their private code from their "My Account" page. Here's a preview of the instructor dashboard. 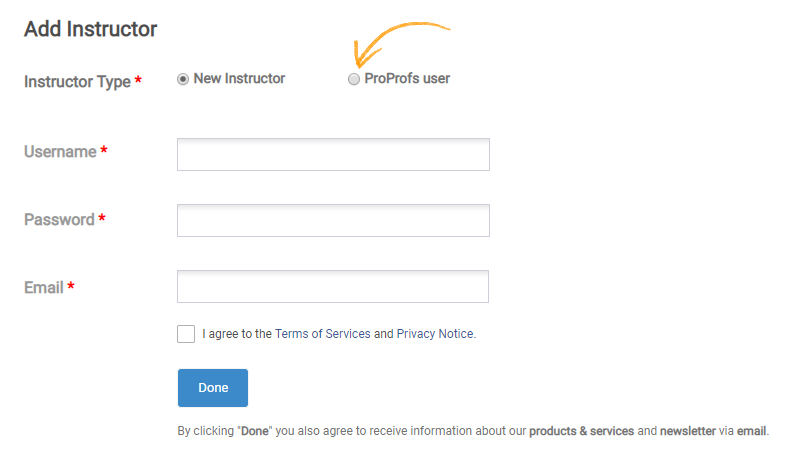 You can preview instructor's courses, edit their profile, change their password, or delete their account. How do I ensure learners spend a certain minimum time on my course?